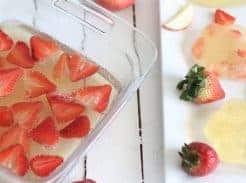 LOOKING FOR A DELICIOUS, HEALTHY, AND KID APPROVED VALENTINE DESSERT? LOOK NO FURTHER! 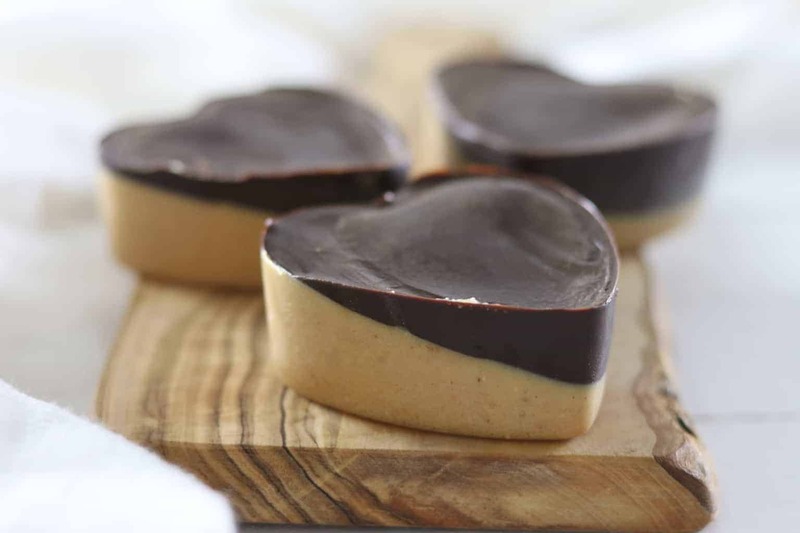 THESE PALEO PEANUT BUTTER CHOCOLATE HEARTS MAKE THE PERFECT VALENTINE TREAT. It is that time of year when all the grocery stores are filling up with red and pink candies, chocolates, and heart shaped lollipops. These are the very things I try to avoid giving my kids. But I also don’t want them to miss out on any of the fun that this little holiday brings. Instead of loading up with all of the artificial dye and sugar we will make our own chocolates, filled with healthy and wholesome ingredients. 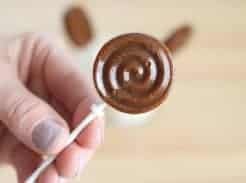 These are simple to make and the kids can even help! My daughter loves to make these and can actually do this one mostly by herself. In fact, she begs to make these almost everyday and she prefers that I record her doing it…she likes to pretend she is making a youtube video, wonder where she gets that from?!? So of course when I made these for my blog, she had to be in the video! 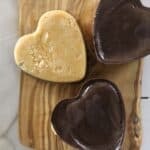 These paleo peanut butter chocolate hearts are sweeten with honey, only require a few ingredients, and will quickly become a family favorite! This post was in collaboration with a few of my blogger friends, be sure to check out their Valentine DIY’s at the bottom. Melt 1/2 cup coconut oil in a sauce pan and then pour into a bowl. Add in the cocoa powder and honey. Stir until well combined. Fill the heart molds half way with the chocolate mixture. Place in the freezer for 10 minutes or until the mixture is hardened. Melt 1/2 cup of coconut oil in a sauce pan and then pour into a bowl. Add peanut butter, honey, and vanilla. Stir until well combined. Pour the peanut butter mixture over the hardened chocolate mixture, place back in the freezer. Once the peanut butter is hardened you can pop the peanut butter cups out of the molds. Store in the refrigerator for up to one week. 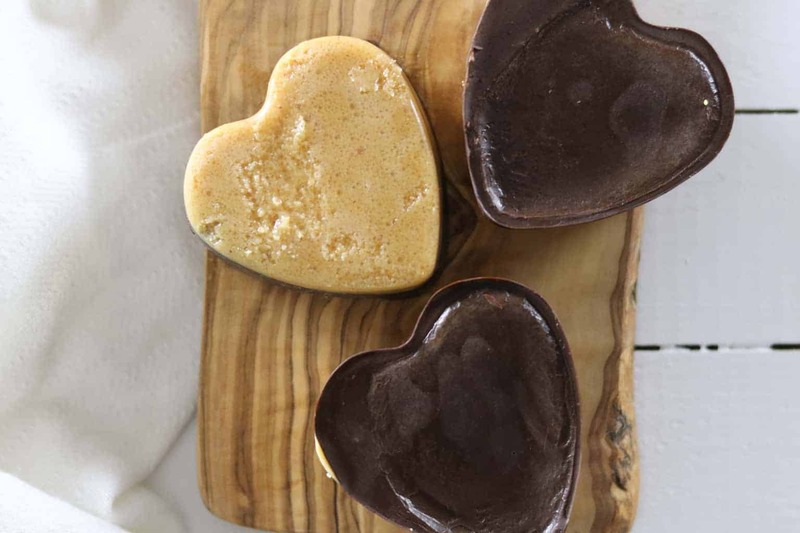 RECIPE NOTES: We used this heart shape mold to get the peanut butter cups to be shaped liked hearts. If you don’t have heart molds you can still make these. 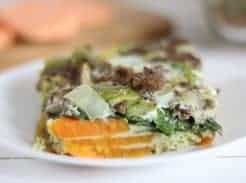 You can pour the layers into a 8 by 8 baking dish and cut them into pieces once hardened. We use a ton of coconut oil over here. We use it in the kitchen for baking and cooking, and I use it for a lot of DIY body products. Coconut oil is a healthy fat that contains medicinal properties. Studies have shown that cultures that eat a lot of coconuts are overall healthier and have lower rates of heart disease. Coconut oil can increase fat burning, kill fungus caused by candida, reduce stress, and it is loaded with natural saturated fats which increases the good HDL cholesterol in your body. When you crush cocoa beans and remove the fat (cocoa butter) you will have cocoa powder! On its own, not in a chocolate bar with added sugar, it contains nutrients that can benefit are health. Cocoa powder is rich in antioxidants, which can help reduce inflammation. 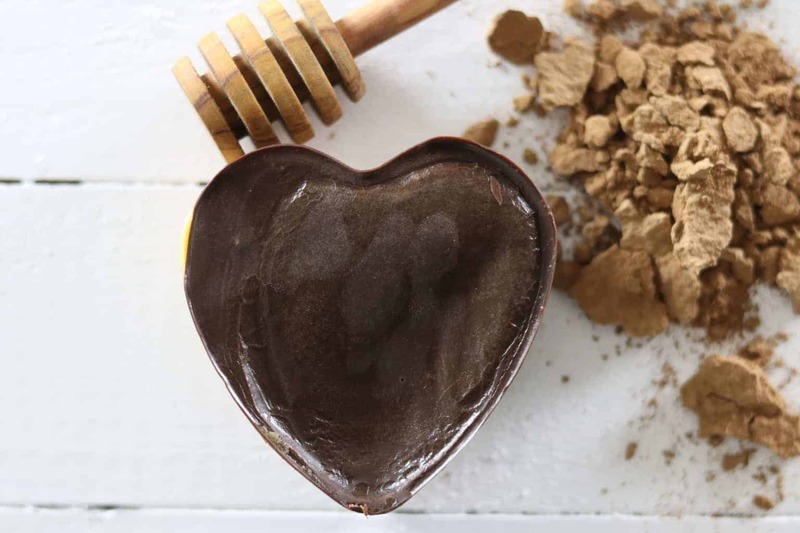 Dark chocolate or cocoa powder has been shown to reduce blood pressure, lower risk of heart attack, improve blood flow, and has antibacterial properties that can support a healthy immune system. I live an hour away from an Amish community and I love visiting them every few months to stock up on raw honey. Better yet, it is local raw honey. I buy it by the gallon because it taste amazing and has so many health benefits. Raw honey is a good source of antioxidants. It has antibacterial and anti-fungal properties. It is great for the digestive tract and for respiratory issues. A spoon full of local raw honey is very soothing for a sore throat and it can help relieve a cough. Add a drop of lemon essential oil to a spoonful of raw honey for a natural cough syrup. Honey can counter pollen allergens making it a natural remedy for seasonal allergies. When buying peanut butter you will want to stay away from any that contains hydrogenated oils. Hydrogenation is a process in which a liquid unsaturated fat is turned into a solid fat by adding hydrogen. This oil is very unhealthy and is actually banned in some countries. Buying natural peanut butters with out sugar is a great option! You can substitute the peanut butter for almond butter or cashew butter if you have a peanut allergy. Be sure to use real vanilla and to stay away from imitation vanilla. Pure vanilla has been shown to be good for your hair and skin. Plus, it can reduce anxiety, support a healthy digestive system, and ease respiratory issues. 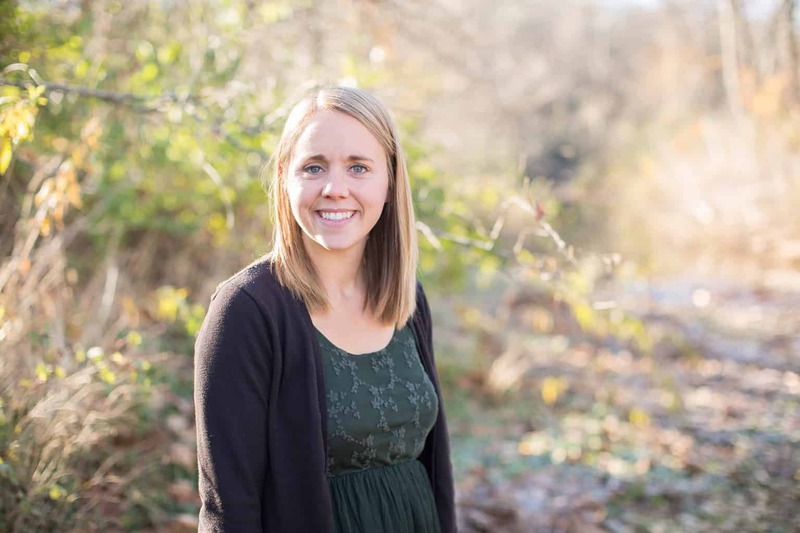 You can feel good about eating these and feeding them to your kiddos! Do you have any tired and true healthy valentine snacks? Delicious, healthy, and simple Valentine's Day treat. These peanut butter cups are kid approved, and will have your guest asking for the recipe. We used a heart shape mold to get the peanut butter cups to be shaped liked hearts for Valentine's Day. You can make these in any shape molds or if don't have molds you can make this in a glass pan. You can pour the layers into a 8" by 8" baking dish and cut them into pieces once hardened. Hahaha yes it is the best combo! This looks sounds amazing! I’m going to try this!